# 3D Terrain Sculpting: Allows users to freely sculpt terrain features such as overhangs and caves directly into Vue standard and procedural terrains. # Localized Infinite and Procedural Terrain Sculpting: Combine the best of both worlds with the ability to locally sculpt features on the infinitely detailed procedural terrains. Now, users have the ability to fine tune or completely rework localized areas on procedural terrains providing even greater artistic control and creativity. # Scene Context Sculpting: Allows users to sculpt terrain features in the context of scene elements. Sculpt rocks and reliefs around vegetation and architectural buildings. # New Stratified Terrain Fractals which allow the creation of richly detailed stratified, terrain features. # New Directional Displacement Engine for textures to create more detailed and life-like surface features with greatly increased performance. # 3rd Generation Spectral Atmospheric Technology which dramatically improves the quality and realism of clouds, god rays, and atmospheric shadows. # Direct Re-Posing of Rigged Meshes: Rigged and pre-animated mesh objects can now be re-posed directly inside Vue. Currently supported formats: 3DSMax, Collada, and Vue Pre-animated Meshes. # New Shader-based OpenGL preview engine for improved real-time performance and previewing accuracy. # Deeper xStream Immersive Integration offering more seamless operation and improved workflow with the leading CG applications, including support for Maya 2010, Cinema4D R11.5, Softimage 2010 and V-Ray for Maya. 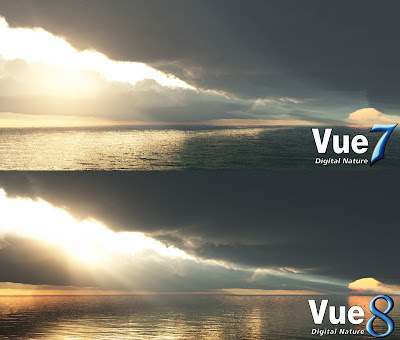 # All the new features introduced in Vue 7.5: camera mapping, planetary rendering, cross-shadowing and cloud masks, spherical cloud maps, animated EcoSystem populations, and more. Бесплатное пособие по созданию и настройке спектральных облаков в вуе! Vue 8 Personal Learning Edition! What's New in Vue 8.4? * Improved Displacement Mapping: computation and rendering of displaced materials on standard terrains is significantly faster and more memory efficient. * Multi-Materials: new Multi-materials allow you to change all materials of any given object in a single operation. Multi-materials can be saved for future use, copy-pasted or drag-dropped between different objects in the scene. * New Material Control: new "Relative to sea" material mapping option, and "Sea level" input node. * User-definable units in Function Graphs: "External Dependency", "Distance to object below", "Distance from camera", and other position-related nodes now express object dimensions in user-definable real-world units. * Easier Pose/Motion Handling: the new Motion Browser lets you visually select and interactively preview preset poses and motions for rigged meshes. * EcoSystem Display Improvements: the rendering of shaded EcoSystem billboards is improved to provide more accurate coloring and reduce flickering when moving around the scene. Vue 3D Environment Competition 2010! ееееееййй!! Набор МАХеров на бетатестирование нового плагина для вуе. * New flicker reduction algorithms: Vue 9 proudly introduces new flicker reduction algorithms developed by e-on software. These algorithms produce animated renders with a noticeably reduced amount of flickering, reinforcing Vue as the ultimate solution for rendering animated natural environments. * Faster Rendering: thanks to internal refactoring, Vue 9 renders up to 30% faster than previous versions! * Relighting: to instantly adjust the lighting of the scene after the render completes – lights can be turned on and off, colors can be changed, all in real-time! * Interactive Network Rendering: thanks to advanced data fragmentation and caching for the distribution of scenes to the rendering nodes, Vue 9 allows for completely interactive network rendering. Scenes are rendered to the screen while the network is handled in the background automatically. * Custom Interfaces: to create simplified high-level controls and access these controls directly from the material editor, the terrain editor or the object editors! * Auto Saving and Scene Snapshots: this unique and innovative technology automatically saves the scenes in the background, while working, without interfering with the user workflow! Vue 9 поступила в продажу! Много призов, всемирная слава... вы готовы показать, кто тут папа? Я да. 1. Spline and Road Tools: Vue 10 includes a comprehensive spline toolkit that can be used for EcoSystems, terrain effects, building roads or creating objects. An automatic Path-finding algorithm can also be used to build realistic roads at the surface of terrains. 2. Dynamic Rocks: Vue 10 features a library of dynamic rock templates that can be used to instantly create single rocks, groups of rocks, or use them in EcoSystems. Each time the user creates a rock from a template, a new and unique variation will be generated. 3. Water Shading Engine and Physical Transparency: Physical water adds absorption and scattering parameters to allow for realistic light absorption in the body of water. Ocean waves now accurately affect incident light to produce realistic underwater caustics. 4. Render Comparison: The new render display dialog now lets the user stack and compare previous renders. Users can overlay and compare 2 renders (including multi-pass layers) and use HDR difference tools for in depth analysis. Lightweight render clones can be created to test various postprocessing effects, without altering the original render. 5. EcoSystem Phase and Lean-out Control: Vue 10 lets the user individually control the phase (animation offset) of animated elements inside EcoSystem populations for creating more natural animations. Phase is totally user-controllable on a per instance basis, using the function graph. 6. EcoSystem Lean-out Control lets the user define how the EcoSystem instances lean out towards zones of lower density. 7. Terrain Editing Improvements: Users can now precisely preview the active zones when painting with a brush that has Environment Constraints applied. A new Custom 3D terrain brush is added to the brush collection. Mask rotation can also be enabled/disabled when painting in the terrain editor. Material painting in the terrain editor is markedly improved. A new Strata3D node is added for the creation of realistic canyon walls and stratified rock formations. And much more! 8. Edge-based Anti-Aliasing: A new edge-based anti-aliasing algorithm is added to complement the previous color-based anti-aliasing strategy. Both AA settings can be configured independently. 9. Improved Depth of Field and Motion Blur. 10. Up to 30% Faster Rendering Speed: Significant internal optimizations made to Vue 10’s rendering engine will result in dramatically accelerated rendering. More details on the new features as well as the complete description pages will be published at the time of release. Все вкусняшки новой версии описаны выше. Специально для любителей не ворованного софта. Все ограничения пле версии - как обычно. Наши любимые разработчики решили порадовать нас новой версией Вуе, дабы ещё больше срубить бабла, ееей. Версия 10.5 поступит в продажу во течение второго квартала 2012. Ура ура! 1. Multiple Vue Camera Import: All Vue cameras present in the scene can be imported to the host application (Vue xStream specific). 2. Directional Light Matching: The Vue sun may now be tied to any directional light from the native scene in the host application (Vue xStream specific). 3. Spline Roll: It is now possible to add roll to spline keypoints using the local rotation gizmo e.g. to create leaning roads or roller coaster rails that bank along bends. 4. Spline Resampling: To complement Vue's Automatic Path Finding, Vue 10.5 introduces Spline Resampling that creates new spline keys while keeping the original spline path to better hug the underlying surface. 5. EcoSystem Stacking: Users will now be able to stack EcoSystem instances on top of each other. This new feature is available both while painting an EcoSystem or directly from the material editor. 6. Rock Convexity: the Rock Convexity material node changes the look of the rocks based on their actual geometry, for instance to create dirty insets or polished edges. 7. TerrainFractal 2: Vue 10.5 introduces a new version of the original Terrain Fractal node with optional stratification. Terrain Fractal 2 generates a higher diversity of natural looking shapes, and rough areas of rocks and cliffs are more convincingly integrated in the relief. 10. Many other improvements such as angular splines, Terrain Color Pattern node, EcoSystem manipulation and customization improvements, Render Stack management improvements, cloud layer dummies grouping and more. Из самого полезного, наверное, это слоёная экосистема и новые террейн фрактал. У квадспайнера в фейсбуке есть клёвые картиночки, демонстрирующие новые возможности экосистем.